Fuxi international auction group co. LTD. This dish is open, shallow abdomen, circle sufficient, fetal quality is exquisite and glittering and translucent, glaze juice ying run is like jade. The whole body is decorated with colorful patterns, and the double circles in the heart are painted with lotus patterns on both sides, surrounding the blooming lotus flower in the middle, with full flower ears and crispy appearance of soft and tender vines, revealing the beauty of lines. The motif on the inner wall is painted with blessing and longevity patterns, integrating the twigs and flowers of the whole week, the motif means good luck and the composition is complete. Rich color changes, each section of the glaze was gorgeous color. Depict in minute detail, set off the flowery of the intercalation of all colors. Like a beautiful picture, intriguing. 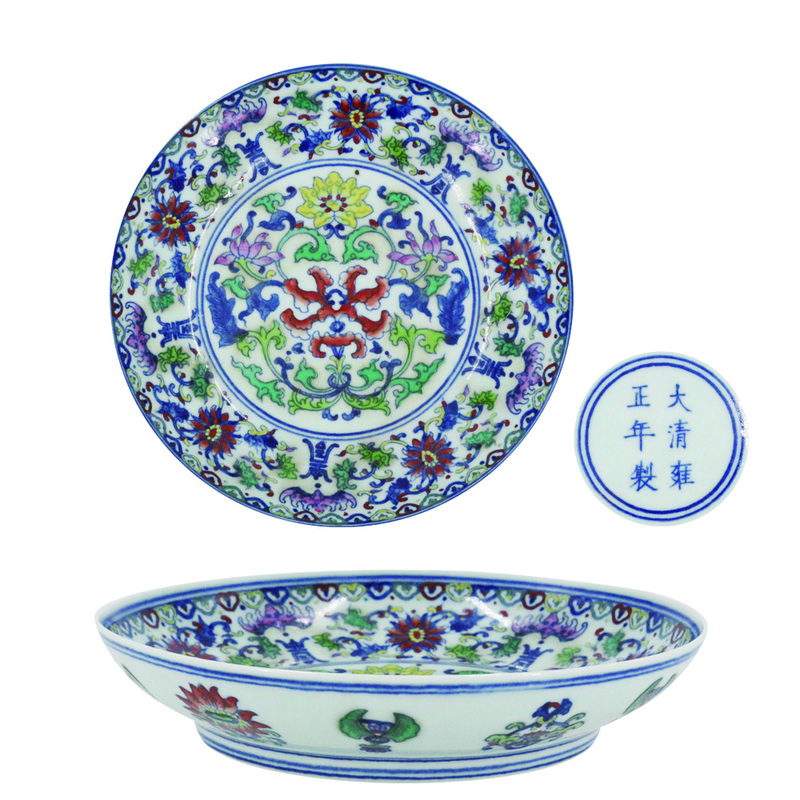 Emperor yongzheng was fond of the way of flowers, paid attention to the beauty of artistic conception, paid attention to the implied meaning of auspicious luck, kept improving the porcelain and pursued perfection. The outer wall of the disc is painted with eight treasures, with exquisite painting skills and pleasant elegance. The bottom book is the qing dynasty yongzheng system six words two lines regular script blue and white double circle style, this product regardless of painting, glaze color and product phase are perfect, it is rare.